People used to smoke in public places. They smoked in restaurants. They smoked in their motel rooms. They smoked at the bowling alley, the skating rink and while visiting their insurance agent, local service station and car dealer. Smokers need ashtrays. Businesses saw an opportunity to accomodate their guests and promote themselves by having an ad printed on the inside of the tray. Most businesses also provided customers with matchbooks with advertising on the cover. Some even gave away cigarette lighters. The ashtrays were provided for use while the guest was on the establisment's property. They were not souvenirs. Souvenir trays and cigarette lighters were sold at amusement parks and city & state souvenir shops. They are ususally ceramic or tin. Souvenir ashtrays are more likely to have a novelty shape - the Washington Monument for D.C. or an outhouse for the Ozarks. The most common and most popular advertising trays are made of clear glass. They are generally square or round with 4 slots for resting cigarettes. These seem to be primarily from the 1950s-1970s. 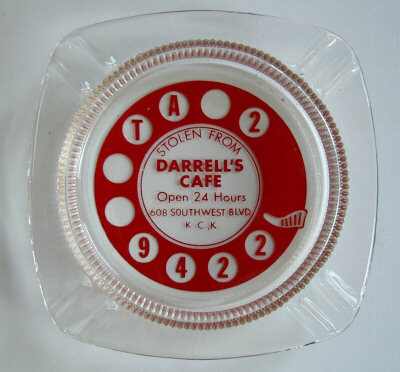 Trays from hotels, motels and casinos are the easiest to find because they were the easiest to steal. You can usually pick these up for under $15. Trays from local drive-in restaurants, gas stations, bowling alleys are harder to find and are generally more expensive. Souvenir trays from defunct amusement parks are also desirable and priced accordingly. City and state souvenir trays are very common and can be found for $5 or less.